Some people don’t have the web space to host widgets, but not everyone realises that Dropbox can be used to host web pages. Go to the Twitter widget page and customize your widget. Get a FREE Drobox account and install Dropbox. Open your Dropbox ‘Public’ folder. Go to Posterous and login. Click > Settings > Edit theme. Click > Advanced – and edit your custom HTML. Leave a comment here linking back to you site so I can also admire it. @RichardMakney thanks for the javasctipt wizardry. I've made the changes to the dropbox file and just waiting for them to filter through to Posterous. It seems to cache stuff. So hopefully you'll see the changes soon 🙂 Thanks again. Hi Elisa, the Twitter.html file does not have any code in it. If you want to email me richard@mackney.com I can help further rather than on here. Hi, Richard you were right, I tried a couple more times and I got it right, it was my mistake, thanks a lot for your help, it is a great widget !! Hello! I’ve tryed to do that. I’ve copyed Public link but when i want to browse it – dropbox shows me an 404 error. So if i upload twitter.txt it loads it.help, please! @_kiradee interesting. it either doesnt exist, or has got confused! can you just change the extension of the txt file to html and see if it loads? 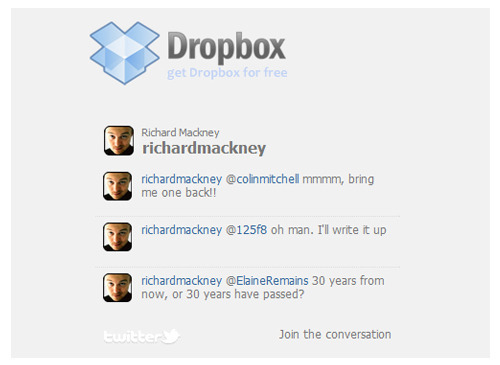 @richardmackney I used Mac’s Texteditor. Will try again. Thank you! @atwice808 it looks OK, it’s loading correctly. What do you think is wrong? It looks fine in Safari but it doesn’t show up in Explorer or Firefox? Any way to fix that? All good now! Thanks so much! Just got this going on my own site – thanks for the tutorial. Haven’t quite got the sizing right but it’s ok for now: http://girodilento.com/ – it’s in the footer and I don’t think I can put it on the side with this theme (shame). Hey Richard, I just followed all these steps, and for some reason I keep getting this when I click on the link from my dropbox. It just comes up as code. Am I doing something wrong?? https://dl-web.dropbox.com/get/Public/twitter.html?w=a7426e21Help! I added the opening and closing tags too, still just comes up as code. I’ve tried it now in both safari and firefox, could it be the version of both browsers I am using?? Hi Richard, I followed all these steps, but I am having problems. Whenever I click on the link from my dropbox it just comes up as code, not the widget. I have tried using firefox and safari and still no luck. Here is the link:https://dl-web.dropbox.com/get/Public/twitter.html?w=a7426e21Could it be the versions of both browers I am using?? @girodilento it is a shame, there would be a way to float it in a div on the right with a bit of playing. Nice site BTW. @TheKaliumKid that looks awesome! glad to help. It’s so much easier not to have to go into the Posterous admin when designing! Also try hosting your CSS elsewhere with FTP so you can quickly change styles when testing! OK so I tried it all again, I copied and pasted my twitter widget code into a text edit doc, added the tags at the top and bottom, and saved it as a .html. I then uploaded it to the ‘public’ folder in my dropbox and that is the code I get. https://dl-web.dropbox.com/get/Public/newtwitterwidget.html?w=088b3ddfIs there something I am doing wrong? I even tried it with and without the html tags just as trial and error, but nothing changed. I don’t know how else to get the dropbox link working? @thisisashaK when I use that link I am getting denied access and the URL doesn’t quite look how it should (should be like http://dl.dropbox.com/u/1542199/twitter.html ) so I’m wondering if you are grabbing the public URL? hmm im a little confused then. How do I get a link like the one everyone else is posting? I am following all the same steps. After uploading my .html file to the public folder in my dropbox, i click on it. Is there something else I am supposed to do instead? oh! Now I get what I did wrong! Here is my link, http://dl.dropbox.com/u/33899052/twitter.htmlLet me know if that works when you click on it. @thisisashaK getting there 🙂 … now the dropbox link works. Now when I view the source of your new page, I can see there is a lot more code than you need. You need to edit the source of that page. At the moment “Cocoa HTML Writer” is converting your twitter script into a viewable page. Ideally you would just edit it with a basic text editor and make sure that the source code only contains the twitter script.Hope that works. Don’t give up. Hey Richard, its me again! Following back up to your last comment on my Code problem, how do I get my code into a viewable page? @thisisashaK open Cocoa HTML Writer and view the source. There will be a lot more code in there than what’s required. Alternatively, start again with a basic text editor rather than a HTML editor. Hope this helps. Hi Richard, tried it and I get a blank space with a scroll bar with code if you highlight it. The Dropbox file is at: http://dl.dropbox.com/u/29150714/twitter.htmlAny thoughts? I used TextEdit on a Mac. Hi Richard, I tried but all I’m getting is a blank space with a scrollbar. If you highlight the area to the left, there’s nothing but code. The Dropbox file is at: http://dl.dropbox.com/u/29150714/twitter.html. Any thoughts? It’s all good…got it figured out after dumping TextEdit and using a html editor. Brilliant work-around! Took a little while, but I think I’ve got it – many thanks Richard:http://www.davidjarman.info/I tweaked the widths: the iframe is about 15px wider than the widget as the widget wasn’t centred. I was missing the edge of the widget getting a horizontal scroll bar.I’ve edited the code in the Dropbox file to try and get the tweets to loop (‘true’) but they don’t seem to be doing so… any thoughts? @dsrjarman try changing the ‘live’ to ‘true’ does that do what you want? Doesn’t seem to. I wonder if I should have ticked ‘poll for new results’ when first creating the widget. I can’t see that variable in the text – might it be the ‘version’ number? Hi Richard, can’t see what I’m doing wrong here, but it works in Explorer but not Firefox. http://www.twentythreetwo.com/, can you spot the problem? @twentythreetwo hi Karen, can you provide the link to the dropbox page and I’ll have a look. Oh, it’s OK, it seems to be working now! Thanks! I’ve checked on all browsers but it appears that mine isn’t working on Firefox 7.0.1 only, must just be that version as it works on older versions. Thank you for this. Do you know how I can install BBC learning widget into my posterous spaces. It would be useful for my students. Richard, would love your assistance on this. Followed your tutorial through, can’t get the widget to produce. Here’s my site: http://www.kishwaukeeyouth.com Here’s my dropbox link: http://dl.dropbox.com/u/15936241/twitter.html I am moving our youth website to Posterous. We use Twitter for, among other things, a phone tree service during camps/retreats. It’d be great to for this workaround to happen, thanks for your help! @fighterkites if you look at the source code of your dropbox file you’ll see that it contains a lot of HTML. You’ll need to go into the ‘view source’ section of Cocoa HTML Writer to paste the code – or try notepad. Hope this helps. I want to add it under the header and above the nav bar , but it doesnt work… 🙁 Can u help please ? Richard this worked! So thankful for your prompt response. I’ll get it in the right place and go from there. Thanks again. I used your instructions to get my twitter widget. Really great! HI Richard, thanks for the great post. I think I followed the instructions, but like some other people here I get a blank space when I insert the code. Can you see what I might have done wrong?http://dl.dropbox.com/u/4242236/twitter.htmlThanks so much! @ml13ml Hi Michael, tweaking the frame height may be a good idea. I like the stuff on your site, your cad drawings of mobile interiors interests me greatly! I don’t seem to get it I’ve pasted the code in Custom HTML but can’t see any changes. I think I’ve rather messed up my posterous. Help please! got it on first round, although not sure if it looks good paperclip.posterous.com – many tks! YAY! Works perfectly for http://blog.pranab.in! Thanks a ton!!! Thank you so much for this post! http://mackinacislandgal.posterous.com/Also thank you for continuing to answering everyone’s questions. I found your replies to some of the comments to be incredibly helpful for trouble-shooting, and with a couple of little tweaks was able to get my twitter feed up. Was even able to get up a flickr widget on top of that 🙂 Thx!! @MackIslandGal brilliant! thanks for the thanks! and great snow pics! Okay Richard, I did it the first time, but now it isn’t coming up on my mrgsblog.posterous.com I changed the template twice and no matter where I post this code along with your string: http://dl.dropbox.com/u/1779007/twitter.html it just shifts stuff down. I would love to put it in the sidebar right under “search” Any ideas? http://dl.dropbox.com/u/1542199/twitter.html so you could just view the source code and change the username. I totally get what you mean about Posterous not being twitter friendly! I understand why Twitter wants you to always hit their dot-com page but, sheesh what the heck?!! Gotcha. Well, twas worth a try. Thanks. At least you know Google Search works! FWIW this is the page I’m trying to add it to: http://saburo.posterous.com/ You can see the “widget” in action right underneath the search bar on the right. Did you mean create a new text file in dropbox???? or other like textedit…? do i then drag that file to drop,,, ijust get jibberish no twitter, your link worked, so think its in my dropbox prep…. ???? and its there in the preview but not once i save it. okay… i’m a dummy. i’ve been trying to make this work for 3 days. is it official that this just doesn’t work? It seems that Twitter have A New Twitter Widget that has now blocked the ability to have a widget on Dropbox!